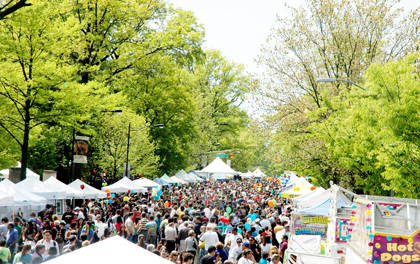 TOWN GOWN CARNIVAL: With Nassau Street in bloom overhead, Communiversity crowds filled the midway for Saturdays thankfully bright, dry celebration of Princetons annual spring fair. Princeton Public Library (PPL) Director Leslie Burger encourages library supporters to participate in a rally in Trenton that has been scheduled for Thursday, May 6, from 11 a.m. to 1 p.m. to protest proposed budget cuts in state funding to libraries. Legislative visits will follow the rally. Over 70 local residents attended the Princeton Future meeting at the Chestnut Street Firehouse on Monday night to strategize possibilities for the former Olive May and West Coast Video sites on the south side of Nassau Street near Murray Place. Standing vacant for over two years, the Princeton University-owned building at 4 Mercer Street recently received the go-ahead from the Borough Zoning Board in a 6-1 vote to utilize the ground floor for offices, with the upper floors used as two residential units. This Friday marks the annual Stand Against Racism, a nation-wide event sponsored by the YWCA, which brings together people of various backgrounds and is designed to combat racism by raising awareness about the issue. At Monday evenings Township Committee meeting, Councilwoman Liz Lempert thanked residents, particularly those who do not have children in the school system, for approving the school budget in last weeks election. “I am very pleased with how the conference went from several perspectives,” said Princeton University Faith and Work Initiative Director David W. Miller as he reflected on the recent all-day program “Civilizing the Economy: A New Way of Understanding Business Enterprise” that drew participants from around the world. Kali Oreksi  enjoy your meal! Its what the Greeks say when they sit down to eat, and its the same sentiment Olives extends to every customer.